French pop jerk, Hungarian folk, Bohemian polka, makossa from Cameroon, Congolese kwassa kwassa, cumbia from Colombia... the world houses an obscene amount of obscure music that you haven’t heard and will never hear. It may not be infinite but it may as well be. Perhaps it’s true that we’re living in the best time to access it all, when so much is available at our fingertips, but that just makes it clear how much is lost in the ether. You only have to spend a few minutes randomly navigating MySpace to discover a whole Mary Celeste of forgotten bands with unloved songs that no one will ever sing again. Thank the lord, then, for Soul Jazz, Light In The Attic, Finders Keepers and all those other independents releasing arcane and lost classics, music from other places and other times that we would never hear without their curating skills. Sdban, the newest imprint of N.E.W.S. Records, stand alongside these labels. Based in Ghent, they specialise in bring you danceable Belgian bounty from the 70s. Much of what you hear comes from label boss Stefaan Vandenberghe’s mightily extensive personal vinyl collection, with bands you almost certainly haven’t have heard of - Bud Hunga & His Diplomatic Music, The Indian Sound Of… Black Foot, Georges Hayes & His Philarpopic Orchestra, Hearts Of Soul & Shampoo, Selectasound 88 & The Bob Boon Singers, and so on. Gazing over the tracklisting, I thought I recognised one name in Philip Catherine (‘Give it Up Or Turn It Aloose’), but it turns out I was mixing up the Belgian guitarist with the French novelty pop singer Philippe Katerine, who sang a rude song about a banana (‘La Banane’). This two-disc double volume collection is a followup of sorts to another two-disc double volume collection, 2014’s Funky Chicken: Belgian Grooves from the 70s, which was the first, also excellent release from Sdban. They have also reissued albums by André Brasseur and Koen De Bruyne, and Brasseur’s track ‘X’ is supposedly the most coveted in this collection. The “grandmaster of the golden Hammond organ”, Brasseur sold six million copies of his instrumental track ‘Early Bird’ in 1965, and then had no more hits ever (apart from on dancefloors at Northern Soul clubs). ‘X’ is something quite different - with a drone organ and the sound of simulated orgasms, it’s far more risque than the end-of-the-pier organ piece he was momentarily famous for. Though a lot of tracks have a Northern Soul feel, there are changes of pace too - Kandahar’s ‘The Fancy Model’ starts with bawdy laughter before breaking into a swing beat which is soon beset by duelling horns, ‘Punktowiec’ by Skleroptak is a supremely funky big band oddyssey, while ‘Skylab’ by Electronic System III is a proggy, ambient, smoochy affair that tops the collection off with clavinovas and squelches. 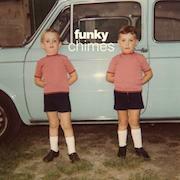 Almost everything on Funky Chimes is instrumental, and as the name suggest, it’s suffused with grooves throughout (though the chimes are less ubiquitous). For those pining for some vocals, Etta Cameron sings and adds soul to the slinky jazz number ‘Guess We’d Better Break Up Now’, while Hugo Raspoet emotes ponderously in Flemish on ‘Spuitje Op, Laat je Rijden’. The well-written, extensive sleevenotes explain that this song is a wry satire on cyclists using performance-enhancing drugs - so it remains topical - although you’d need to be fluent in Flemish to understand it. Indeed, Funky Chimes no doubt leads to many fascinating stories just waiting to be uncovered. It could be the start of some happy adventures, it could even prompt you to learn a new language; if nothing else it will introduce you to some great Belgian grooves that would have been left behind had Sdban not taken the care to bring them back to us.